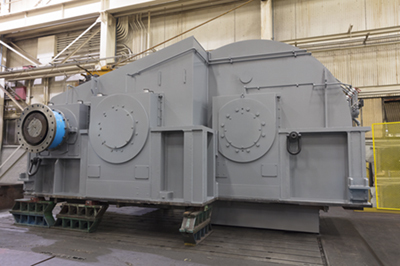 HORSBURGH & SCOTT PROVIDES THE TOUGHEST, MOST RELIABLE GEARING SOLUTIONS FOR STEEL PROCESSING. Horsburgh & Scott HAS ADVANCED EQUIPMENT AND EXPERT ENGINEERS AND TECHNICIANS THAT CAN ACCURATELY DIAGNOSE ANY GEARBOX ISSUE AND SUGGEST THE BEST POSSIBLE OPTION FOR REPAIR, MAINTENANCE OR REPLACEMENT. With advanced equipment, expertise, and state-of-the-art facilities, Horsburgh & Scott provides a full turnkey solution for all your gearing needs in steel processing applications. Horsburgh & Scott SPECIALIZES IN GEARBOX REBUILD, REPAIR AND REDESIGN. WE HAVE BEEN IN BUSINESS FOR OVER 135 YEARS AND HAVE SEEN ALMOST EVERY TYPE OF GEAR IN THE STEEL INDUSTRY. With robotic welding equipment for precise and strong welds. Produces gears and gear teeth that are harder than the original and can withstand the high demands of the steel industry. Our overhead cranes are among the largest in gearing and can lift up to 75 tons. HORSBURGH & SCOTT USES THE MOST ADVANCED GEAR CUTTING TECHNOLOGY TO DELIVER THE HIGHEST QUALITY GEARING SOLUTIONS. Opt-in to receive our newsletter with important product and service announcements.